Valutata dagli ospiti dopo il soggiorno presso Androniki Apartment. Wonderful apartment for our family of 5. Very spacious and clean. Located on the top floor in a very quiet location. Great 24 hour bakery at the end of the street. Adroniki was very welcoming and had kindly left some surprises in the fridge that we appreciated after the drive from Athens. The apartment is located a short 5-10 minute stroll into the old part of town. We found this a blessing as we could park the car outside the apartment without a problem and it was a quiet location. Adroniki also made some great restaurant recommendations that the locals visit which we went to and thoroughly enjoyed. Another plus for us was also the washing machine and spacious balcony that we could dry our clothes. There was also an outdoor table where we enjoyed breakfast and had a direct view of Palamidi Castle. We would thoroughly recommend Adroniki as a host and her apartment. Όλα ήταν τέλεια!!! Το διαμέρισμα πολύ ωραίο , καθαρό και η ιδιοκτήτρια πολύ καλή και εξυπηρετική!!! Όλο ήταν πολύ καλό , καθαρό μεγάλο σπίτι για 6-7 άτομα, εξυπηρετική η κυρία... Αξίζει με το παραπάνω ειδικά για παρέα με πολλά άτομα.. Κ να πάτε να φάτε στ πηδάλιο..
Υπέροχη θέα! Καταπληκτική διακόσμηση και ευρυχωροι χώροι...! Androniki fue muy amable con nosotros. Nos esperó pacientemente a pesar de que llegamos bastante más tarde de lo convenido. Además nos dio mucha información sobre Nauplia y los lugares más recomendables para comer y comprar. En cuanto al apartamento, todas las habitaciones están decoradas con mucho gusto y cuentan con aire acondicionado que se agradece muchísimo en verano. Assicurati un ottimo prezzo per Androniki Apartment, valutato di recente dagli ospiti con un punteggio di 9,9. Situato a Nafplio, a soli 1,3 km da Piazza Syntagma, l'Androniki Apartment offre una terrazza e la connessione WiFi gratuita. Questa sistemazione offre l'accesso a un balcone. L'appartamento presenta 3 camere da letto, 1 bagno con vasca e doccia, e una TV a schermo piatto. A vostra disposizione una cucina con forno, tostapane e macchina da caffè. Il Castello di Akronafplia dista 1,3 km dall'appartamento. 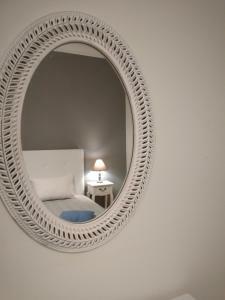 Quando vuoi soggiornare presso Androniki Apartment? Appartamento con TV a schermo piatto, bollitore elettrico e tostapane. The apartment is around 130 m2 , the decor and all the appliances are brand new, the beds are king size and very comfortable ,the kitchen is fully equipped with all the necessary utilities, coffee maker, kettle, toastie machine. It has everything you need to prepare breakfast, lunch or dinner .The living room is very big with a sofa bed and TV . Fresh towels, bed sheets, hair dryer and an ironing board also provided. New A/C inverter has been installed for both cooling and heating. A large balcony with palamidi view, where you can enjoy your coffee in the morning... or relax in the evening with a nice glass of wine. I will personally welcome you to the apartment,and if you like, i will give you recommendations about what to see and enjoy in Nafplio.You can always contact me at any time with any questions you may have. My prorioty is for you to enjoy the apartment and the beauty of the city!! Leggi prima di prenotare Androniki Apartment accetta le richieste speciali. Aggiungile nel prossimo passaggio! Siete pregati di comunicare in anticipo a Androniki Apartment l'orario in cui prevedete di arrivare. Potrete inserire questa informazione nella sezione Richieste Speciali al momento della prenotazione, o contattare la struttura utilizzando i recapiti riportati nella conferma della prenotazione.